Let’s look at each one and consider some remedies. Take a look at the equipment your dog is wearing. Is it designed to cause pain or discomfort? (choke chain, prong, collar high and behind the ears?, etc..). Listen to your dog – test out different types of equipment and see what your dog likes. For a dog who is afraid to go outside, you might have to start indoors, close to the door, then work your way closer to outside in tiny increments. Break up walks – take breaks to hang out, do tricks, etc..
Keep a good distance from things that get the dog aroused – like other dogs. Some dogs might tug at the leash because it’s fun or because it has been taught. Heavily reinforce another tug/play item that is not the same texture as the leash – do this when not walking. See Jean Donaldson’s “Culture Clash” for tug rules. Teach a positively taught “out” so you have more control over how the game starts and when the game needs to end. Be sure to use lots of lots of impulse control with this game – so your dog does not become over-aroused. Then when out on walks, ask for a quick tug game with this toy long before the dog grabs the leash. Just a quick game, then back to walking. Then maybe another quick game then back to walking. If the dog starts getting too aroused, see above for arousal/frustration… Eventually work towards calmer walks. When not walking, teach “leave it” or “drop it” using only positive reinforcement. Proof it in teeny tiny increments. Then use it during walks when necessary. Ask dog to drop the leash. Heavily reward when he/she complies. Making the leash inconsequential can also help. See the above loose leash walking summary – Part 5. 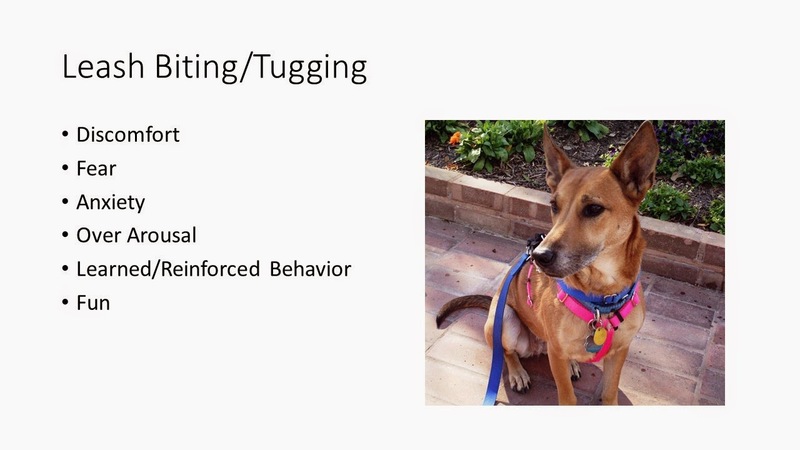 Keep dog engaged during most of the walk... talking, treats, etc..
Management - These remedies might not address the underlying issue but it might help keep the dog from practicing the undesired behavior while the pet parent addressees root causes or implements training. Clip two leashes for your dog (and carry a 3rd one just in case). When dog grabs a leash, drop that leash. And pick up the other one. If he grabs the one you are holding then switch. Quickly recover a dropped leash to avoid tangling/dragging. Walk the dog in a back clip harness. The leash will be further from his mouth and harder to grab. Even better is a sled type harness where the clip is even further down the back (work with your vet on fit and comfort). Harnesses do not promote pulling. Some people might suggest encouraging the dog to hold a toy in his/her mouth. A toy can be a wonderful "pacifier;" but consult with a vet on the safest way to do this. Dog who walk long distance or walk in warm/hot weather need to be able to easily pant. Holding the toy might affect proper panting. What if you aren’t sure whether your dog’s issue is because of fun, fear, arousal, etc..? If unsure, it’s probably best to treat it as fear or arousal before assuming it’s just for fun. It won’t hurt anything to work on loose leash walking, impulse control etc.. Pulling hard on leash, etc..
For more on reading dogs, see books by Brenda Aloff, Truid Rugass, Martina Scholz and Clarissa von Reinhardt, etc.. Bitter Apple – does not address the issue. It might stop a dog from grabbing the leash (might not), but some dogs might redirect to pants legs, human skin, etc.. And adding an aversive will contribute to issues rather than solve them. Chain leashes – Chain leashes are okay for those who prefer them. But they will not address pain, fear, over arousal etc.. A determined biter might bite the leash and hurt him/herself. A dog who chooses not to bite the chain leash, might redirect. A human trying to hold on to a chain leash (on a pulling dog) might hurt his/her hands. Physically take the leash out of his/her mouth; Pull on the leash. This will most likely get the dog over aroused or must make him want to hold onto the leash more. Best to trade with a toy, or another leash or food.